Though Facebook was ultimately not in the mix to buy Skype, the relationship is still going strong and will reportedly result in Skype’s video chat service finally coming to Facebook next week. TechCrunch reports (s aol) that Facebook’s “awesome” announcement July 6 will include word that desktop Facebook users will be able to conduct video calls via Skype. The details are little hazy about how it all comes together and whether Facebook users will need to download the Skype client for the computer, but TechCrunch said it will be an in-browser experience for users. If true, it makes a lot of sense and is something we’ve talked about before during speculation about a potential acquisition or partnership. Facebook has been growing as a communications service, with its unified inbox and its instant messaging service. And it has been looking to branch out with its purchase of messaging app Beluga and its commenting plugin. Integrating Skype will allow it to take the next step in interaction, which is increasingly turning to video chat. Apple (s aapl) has helped accelerate video chat with its FaceTime technology, and now video conferencing is becoming a crowded market. By getting on board with Skype, Facebook can also blunt some of the advances of Google+ (s goog), which has a slick group video chat feature called Hangouts. Om remarked at the Google+ launch that Hangouts could bring Skype to its knees. Combining with Facebook could help avoid that fate. It’s unclear if Skype on Facebook would include free group video chats, which is a premium feature on Skype, but it could easily be an option. Skype service could also be a big boost for Facebook’s mobile app if the service is eventually integrated. Video chat integration would further strengthen Skype and Facebook’s relationship. Skype has added Facebook integration into its software, allowing people to instant message, tap their Facebook contacts and “like” or comment on a friend’s Facebook status. That allowed Facebook to appeal to Skype’s base, which currently numbers 170 million connected users. By getting onto Facebook’s platform and reaching its more than 700 million users, Skype can further realize its larger ambitions to be on all screens, from mobile to TV sets. Together, they can keep users from spending time on other sites and services. This becomes more important with competition from Google, which has the potential to tie up more user time with Google+ in combination with its existing properties. With Skype now a Microsoft (s msft) property, there’s additional logic to a partnership with Facebook, which Microsoft has a small stake in. Together, all three are better positioned to contain Google as it continues to grow. We still have to see if this pans out, but again, this seems like a logical and expected step. By bringing Skype into Facebook, it lets both get what they want. And it shows that Facebook didn’t have to buy Skype to get what it needs. After this integration, I will not use Skype. 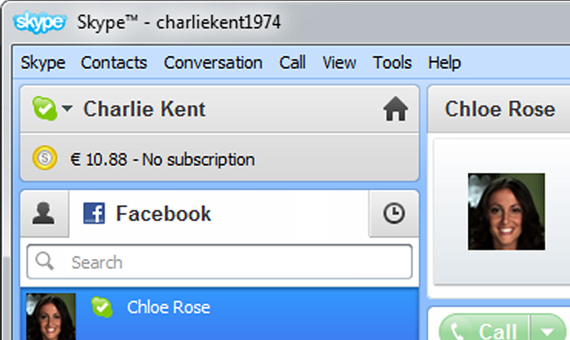 For me, facebook + skype sounds great! Since MS and Facebook understood that Google+ is a holistic platform which they can only defend from if they combine their services. Google+ is shaking the ground and companies simply react quickly. I wouldn’t underestimate the power of brand Skype. Most people out in the street don’t know any other video calling technology so if this is integrated well I can see it doing very well indeed.